Why Is My Labrador Still Overweight? One visitor can't figure out why her obese pet just isn't able to lose weight. Visitor: Why Is Labrador Still Overweight? I have a three-year-old Lab that is overweight at 96 pounds. We are feeding her 1 1/2 cups of Innova weight loss food twice a day. We have had her thyroid checked and the vet says it is fine. We have tried eight different kinds of weight loss foods, including prescription foods, with no success. We walk our dog between two and three miles daily and play with her in the yard. We have a six-month-old Lab pup that also keeps her on her toes! We are at a loss for what to do now. Our dog is very lazy and seems to be depressed. Is there anything available that will help her take off the pounds? We are very worried! It certainly sounds like you are giving your dog adequate exercise, and three cups of food a day is not excessive either. Diet and exercise are the best ways to address an obesity problem, and I do not know of any products for dogs that would help. Although your vet has tested your dog for a thyroid problem, I think the situation bears further medical investigation. Weight gain, lethargy and depression are all symptoms of various illnesses, and it will take a professional veterinarian to conduct testing and determine exactly what is going on. 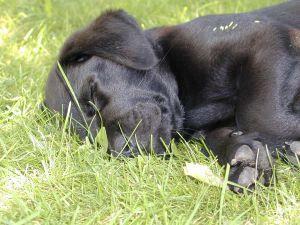 As an example of an illness that combines some of the symptoms you describe, I'd like you to take a look at our article about Cushing's Disease in Dogs. I'm not inferring a diagnosis here because I am not a vet, but this is something to ask your own vet about, and it should at least inspire some brainstorming about what's really causing your pet's weight gain. Thanks for your question, and I hope your dog's health improves very soon.